It is less known that the Romans built on the Vomero hill above and behind the main body of the city. Before the Romans cut through the Posillipo hill with the tunnel now popularly called the “Neapolitan Crypt” for an easy (once you got the tunnel dug!) sea-level passage out of the city to the west, the only road from Naples to Pozzuoli was the Via Antiniana (the etymology of the name is unknown). It was a hill climber and a major demonstration of something the Romans did very well in their Imperial Age —road building. At the Neapolitan end, the via Antiniana started at the center of Neapolis and passed through a gate in the western wall. (All of the following points of reference are modern names.) It then climbed the steep salita [ascent] Tarsia, went past Piazza Mazzini and up via Salvator Rosa and its extension, via Cerra; it skirted around and below the highpoint of the hill (where the Sant’Elmo castle stands) and moved across in a straight line to the ridge along via Belvedere and along the top of Vomero, east to west, to drop down at the other end of Vomero onto the plain that led to the via Domiziana and Pozzuoli. The Via Antiniana was rebuilt as late as 100 A.D. There are still visible remnants of the roadbed (basolato) on the Vomero (at Piazza degli Artisti), and some paving stones, called basoli, have been used over the centuries in structures built in the area, including the villa Salve (also known as the villa Winspeare). At the bottom of the Vomero on the Pozzuoli side, several bits of the road are preserved in the excavated thermal baths on via Terracina near the Fair Grounds (the Mostra d’Oltremare) and on the grounds of the Mostra, itself. 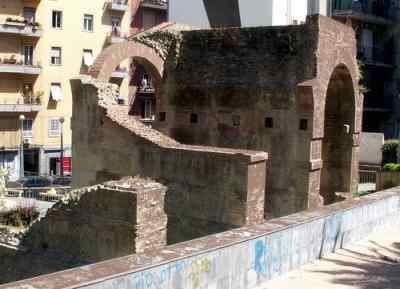 During the excavation for the Salvator Rosa metro station (approximately half-way up the hill on via Salvator Rosa), remains were found of a bridge-viaduct of the Via Antiniana (photo, top). Some of that structure has been restored as an archaeological site and may be viewed. The structure is believed to have consisted of seven arches. It was built in reticulated brickwork; the lintels of the arches consisted of slabs, called bipedal bricks, (60 cm—23.6 inches—on a side) clamped into the back vaults. The barrel vaults were built with a cast of cement in a wooden framework supported by centerings. A system of large brackets in piperno rock anchored to the high part of the walls was used to hook scaffolding for the maintenance of the viaduct. Parts of the bridge were actually incorporated into an 18th-century building, itself torn down during the excavations for the new train line.